With its characteristic square base rising into two spiraling towers, Tel Aviv University’s Cymbalista Synagogue and Jewish Heritage Center stands out as one of the most extraordinary works of architecture on campus and in Israel. Designed by world-renowned Swiss architect Mario Botta, the building contains the highest quality materials and furnishings from around the world, including the Torah ark of Pakistani onyx stone, the golden-hued stone interior walls from Tuscany, the black granite floor from Zimbabwe, the reddish exterior stone from the Italian Dolomites and the light wood ceiling from Switzerland. The Jewish Heritage Center functions as a meeting ground for symposia, seminars and debates. 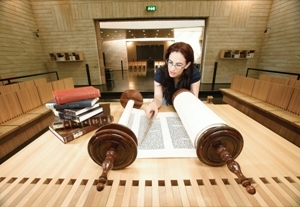 Leading scholars of Jewish culture and related domains hold weekly lectures on topics in all fields of Judaism, including theoretical and practical issues that preoccupy Israeli society. Lecturers come from both Israel and abroad and offer their diverse perspectives and insights. These events are well attended and unite the campus with the outside community. For more information about the Cymbalista Synagogue and Jewish Heritage Center and the Bet Midrash, please visit their website.